Saturday was the first circuit race of the year with the Michelob Ultra Circuit Race at Glenwood. Circuit races are about half the distance of a standard road race. With Michelob Ultra on the line, riders can still consume the same amount of beverage and not be concerned that half the distance is only half the calories spent. Is that the idea? Tom Wick started the day with a 2nd place finish in the Cat 3 race. Tom put in a massive dig with one other rider coming into the finishing straight, getting a jump on the field and maintaining it to the line. Jay Hilwig pulle d a similar move in the Masters A/B race to get a jump on the field and take 2nd in that race. In Masters C/D, Chris Broyles unleashed the power to claim 5th. Brian Hitchcock took 3rd in the field sprint in the Cat 1/2 race, placing him 6th for the day. 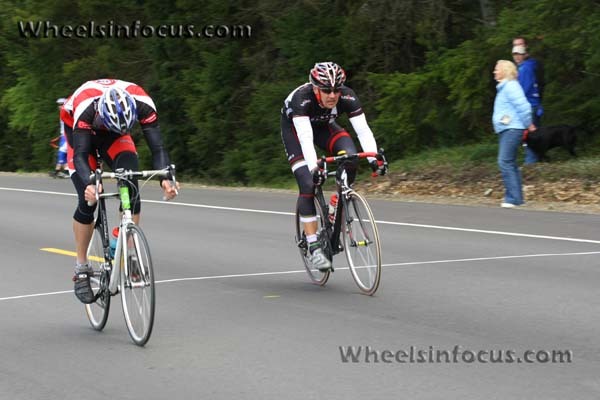 Sunday the old-and-slow guys went out to Longbranch for the Masters State Road Race Championship. The normal course had an additional section tacked on that included some leg-sapping rollers, a short climb, and a tough section with significant headwind making this a real grinder of a race course. Only the most deserving were going to finish at the front of this course. Kevin Masterson and Nikos Mills softened up the Masters A field giving Kyle 'not-so-old and not-so-slow' Farrell a chance to slip from the pack with one breakaway partner. 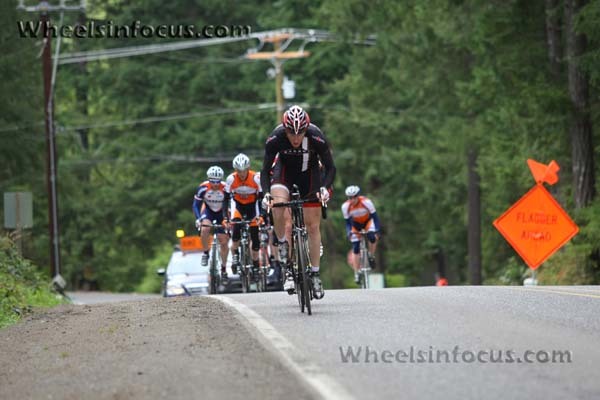 After holding the rapidly dwindling pack off for the better part of three laps, Kyle crossed the finish line solo and convincingly claimed the State road race title. With a slew of top 10 performances including a State Championship, this was a great weekend for the Garage Racing team.